FOTO-MAT ENTERTAINMENT is pleased to introduce it’s new Digital Photo Booth. Everyone loves a photo booth. The fun, excitement and hilarious photos generated by the photo booth always make it a top revenue-earning attraction! The line and laughter at the photo booth never ends! We are proud to say that we have the BEST PHOTO BOOTH IN THE WORLD, PERIOD! No other photo booth on the market today can come close to matching our picture quality! Our revolutionary digital photo booth combines the very latest in high resolution 14 megapixel digital technology with the outstanding reproduction quality of dye sublimation. Our photo booth will generate more revenues than any other photo booth on the market today. We’ve gone head-to-head with all the major competitors and have out-performed them all! Our digital photo booth is a fully self-service machine that offers the customer SIX (6) DIFFERENT POSES in either COLOR or BLACK & WHITE! OUR PHOTO BOOTH DOES BOTH! U.S. Passport Approved photos, as well as six (6) identical ID-size photos. Ultra fast processing and printing. The finished photograph is delivered in less than 20 seconds, not 4 ½ minutes like the traditional chemical photo booths! Easy-to-use operation. There are voice and on-screen instructions to assist the customer. Prints two (2) strips of photos. The photo booth can be programmed to automatically print two (2) strips of photos for those events that may require it. Women love our photo booth! No other game or attraction in an arcade will generate more female-based revenue than our photo booth. Eighty-five percent (85%) of all photo booth customers are women. In many arcades there are too few games for young women. Our photo booth helps fill that need. All photos are stored on the hard drive. All of the stored photos taken during an event can be easily downloaded onto a disk for the customer. The patented “Flash” system eliminates blurred photos. Small footprint. Our attractive photo booth can fit just about anywhere. The actual size is 57”L x 30”W x 72”H. It operates on standard 115VAC. It weighs 625 lbs. 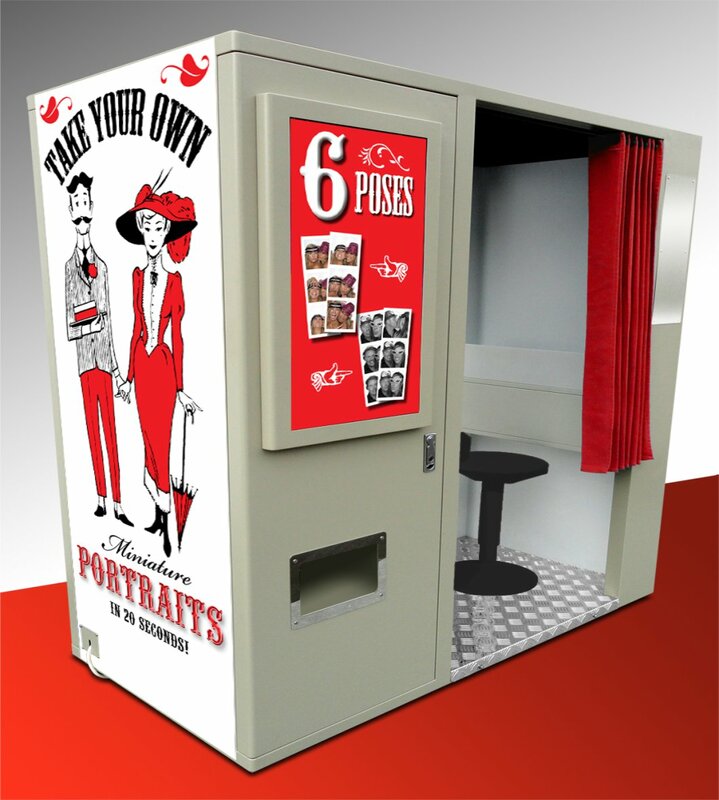 Our customers can take six (6) different poses, more than any other photo booth! Our photos are larger (2” x 2”) and can easily accommodate three or more people in each picture! The Photo Booth will draw additional customers into your business. You will offer your customers a fun and exciting attraction that they will enjoy and appreciate for years to come!